Performing up to high expectations coming into the season, both Boulder City High School swim programs routed Sunrise Mountain in the season-opening meet Saturday, March 16, at Heritage Park. (Robert Vendettoli/Boulder City Review) Racing to the finish line, Boulder City High School sophomore Sophie Dickerman finished third in the 1600-meter run in the Eagles' weekday event on March 13. Placing first in all eight individual events, the Eagles routed the Miners 192-13 behind senior A.J. Pouch and sophomores Joe Purdy and Seth Woodbury, who each won a pair of events. Pouch, placed first in the 200-yard individual medley (1:55.34) and 500-yard freestyle (4:48.78). Purdy placed first in the 100-yard butterfly (59.03 seconds) and 200-yard freestyle (1:55.34). Seth Woodbury placed first in the 100-yard freestyle (57.74 seconds) and 100-yard breaststroke (1:10.60). Senior Elias Woodbury and sophomore Cyrus Peterson rounded out the effort with first-place finishes in the 50-yard freestyle and 100-yard backstroke, respectively. Leading the Lady Eagles past Sunrise Mountain 208-46, seniors Rose Pouch and Aimee Garcia and junior Quinci Thomas each won two events. Rose Pouch placed first in the 100-yard (54.28 seconds) and 200-yard freestyles (2:00.03). Garcia placed first in the 50-yard freestyle (26.18 seconds) and 100-yard butterfly (1:01.62). Thomas placed first in the 100-yard backstroke (1:05.53) and 200-yard individual medley (2:22.15). Junior Megan Johnson had a first-place finish in the 100-yard breaststroke (1:23.72). Sophomore Daphne Thompson won the 500-yard freestyle (6:05.33). Swimming again at Heritage Park on Saturday, the Eagles will take on Valley and White Pine. Hosting a weekday event March 13, both Boulder City High School tracks and field programs finished on top in the four-team meet. The Lady Eagles raced past their competition, finishing with a team score of 91, while Somerset Academy-Losee finished second with 48 points. 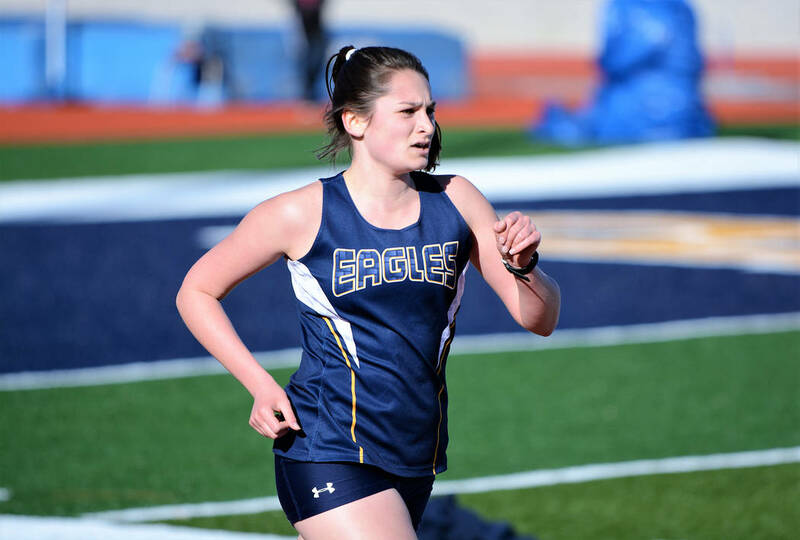 Senior Geri Wachtel led the way for the Lady Eagles, placing first in three events: 100-meter hurdles (17.9), 300-meter hurdles (57.0) and high jump (4-1). Senior Erin Cowley placed first in the discus (84-1) and shot put (28-10). Junior Trinity Oeland placed second in the 100-meter hurdles (21.0) and 300-meter hurdles (1:03.1). Sophomore Christina Dunagan placed first in the pole vault (6-0) and junior Keely Alexander finished second in the 200-meter dash (28.5). In distance running, freshman Mary Henderson placed first in the 3200-meter run (13:54.8) and second in the 1600-meter run (6:26.2). Sophomore Sophie Dickerman finished third in the 800-meter run (3:12.3) and 1600-meter run (6:48.4). Helping the boys escape Western (60), Boulder City finished with a team score of 62, behind four top-three finishes from sophomore Sonny Peck. Holding a pair of first-place finishes, Peck won the 110-meter hurdles (19.1) and pole vault (8-0) events, while placing third in the long jump (17-0.5) and triple jump (35-5). Senior Christian Long won the high jump (5-2). Sophomore Sean White placed first in the 3200-meter run (12:07.9). Placing second for the Eagles were senior Tre Hershey in the 100-meter dash (11.2), sophomore Rafe Echeverria in the discus (83-06) and freshman Travis Wood in the 3200-meter run (13:41.8). Results from Tuesday’s, March 19, meet against Sunrise Mountain were unavailable. The Eagles continue their season Friday, March 22, at Coronado in the Silver State Invitational. Boulder City High School’s boys golf team won its first two league matches behind the strong play of sophomore Blake Schaper. Placing first in both matches, Schaper shot a 88 on the par-72 course at the Paiute Golf Resort on March 13, while shooting a 77 on the par-72 course at The Club at Sunrise on Tuesday, March 19. Defeating Sky Pointe (453) with a team score of 381 at Paiute, junior Jason Krumm finished second with a score of 95, while senior Kevin Phelps finished third with a 97. Defeating rival Virgin Valley (398) with a score of 333 at The Club at Sunrise, Phelps finished second with a score of 83, while senior Chase Hamel finished third with a score of 85. Junior Dustin Landerman and sophomore Kyle Carducci finished tied for fourth with scores of 88. Staying with league play, the Eagles have a match at Las Vegas National on Monday, March 25, followed by a nonleague contest against 4A Green Valley at Legacy Golf Club on Tuesday, March 26. Boulder City High School’s boys volleyball team split a pair of games this week, defeating 4A Tech on March 13 while falling to 3A Sky Pointe on Tuesday, March 19. Picking up a come-from-behind 3-2 victory over the Roadrunners, junior Preston Jorgensen (28 kills) and senior Karson Bailey (26 kills) powered the Eagles to their biggest victory of the season 25-11, 21-25, 20-25, 25-18, 15-12. Defensively, Jorgensen added 20 digs and freshman Kannon Rose added 24 digs. Falling to defending 3A state champion Sky Pointe 3-1, the Eagles held tough despite a 26-24, 21-25, 20-25, 24-26 defeat. Offensively, Jorgensen generated 24 kills and Bailey tallied 19. Sophomore Boen Huxford dished out 34 assists. Defensively, Rose had 20 digs. Getting into the heart of their league schedule, Boulder City will host Mojave tonight, March 21, and Del Sol on Monday, March 25, followed by a road contest at Sunrise Mountain on Wednesday, March 27.